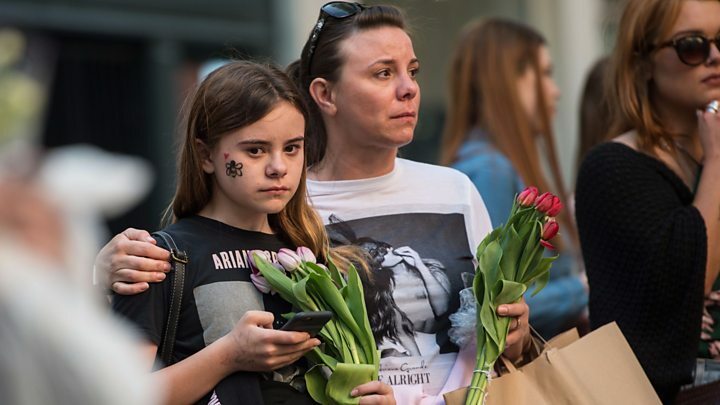 An emotional memorial service marking the first anniversary of the Manchester Arena attack has been held. Twenty-two people were killed and hundreds injured when a bomb was detonated at the end of an Ariana Grande concert on 22 May 2017. Prince William and Prime Minister Theresa May joined families of victims at the Manchester Cathedral service. The Dean of Manchester said it was for "those whose lives were lost and those whose lives have been changed forever". It was broadcast to the crowds outside in Cathedral Gardens on a giant screen. 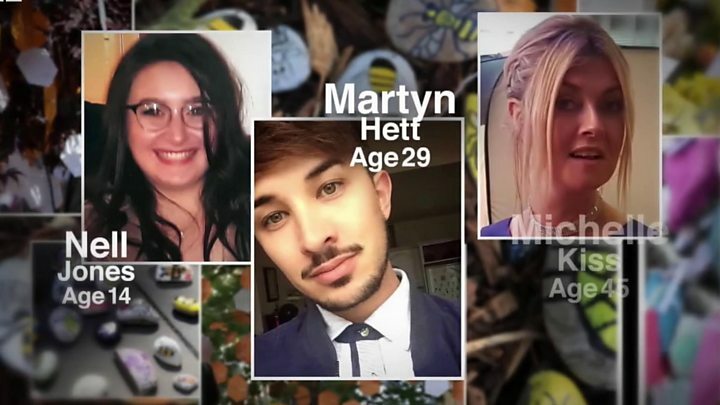 Media captionWho were the 22 victims of the Manchester Arena attack? Welcoming people to the service, the Very Reverend Rogers Govender said they had "come together as people of different faiths and none" to remember those affected by the attack. He was followed by short addresses from a number of faith leaders, including Nidhi Sinha, Rabbi Warren Elf, Imam Irfan Chishti and Sukhbir Singh, and from humanist Dr Kevin Malone. It also saw a bible reading from the Duke of Cambridge and performances from the Manchester Cathedral Choir and the Halle Youth Choir, who sang a rendition of Somewhere Over The Rainbow. 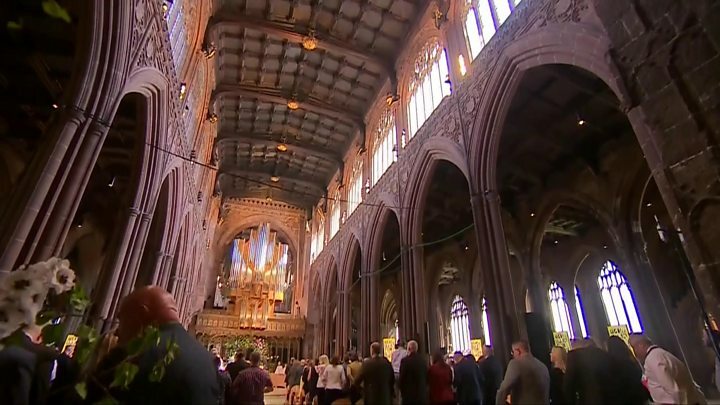 The service, which had been relayed live to screens in Liverpool Metropolitan Cathedral, York Minster and Glasgow Cathedral, closed with a blessing from the Archbishop of York, Dr John Sentamu. After leaving the cathedral, Prince William, Mrs May and other political leaders, including Labour's Jeremy Corbyn, left messages on the "Trees of Hope" - a trail of trees which are being adorned with special tags for the anniversary. Hundreds gathered in Cathedral Gardens to watch the service and those present spoke of love, not hate. Two women hugged each other for support as two giant silver 22 balloons fluttered above them in the wind, while a teenage girl sobbed as photos of the victims were shown on a giant screen. Tears rolled down a man's face behind his sunglasses, as he struggled to control his emotions. And as the Dean of Manchester announced the minute's silence, the whole crowd rose as one. Police officers, firefighters, teens in Ariana Grande T-shirts and pensioners bowed their heads together and two men dressed in bee costumes stood next to a man waving an anti-IS banner. Just as it was a year ago, this was a city united. The day of remembrance also included a national minute's silence at 14:30 BST and a mass sing-along in the city. Ariana Grande, who recently called the attack "the worst of humanity", tweeted that she was "thinking of you all". The singer, who headlined the One Love concert in Manchester less than two weeks after the terror attack, said on Twitter: "I love you with all of me and am sending you all of the light and warmth I have to offer on this challenging day." Rhiannon Graves, from Hull, was at the star's concert when the attack happened. Joining the throng outside the cathedral, the 17-year-old said she "had to be here to show love and solidarity". "I had just left the concert arena when it went off - I'll never forget it." Her friend Lois Beaumont, 18, was also there and said she thought about it "every day". "I wanted to come to show my respects for those who didn't make it or who were injured." A multi-faith group holding banners reading "Manchester City United" and "Total Love" were met with applause by those outside the cathedral. Mohammed Khan, 66, said the group "wanted to show solidarity with the victims". "We shall not be disunited. This attack was evil." Before the service, people who were caught up in what happened on the night have been sharing their reaction to the anniversary. Adam Lawler went to the concert with his friend Olivia Campbell-Hardy, who died in the suicide bombing. The 16-year-old was hit by shrapnel and said he "broke both my legs, lost seven teeth [and] nearly lost my right eye". "I regained vision in it, thanks to the amazing doctors. I nearly lost my tongue," he said. "If I could go back in time, I would change everything. But I can't, so what I'm going to do is I'm going to try and live my best life. "We won't be beaten because we're Manchester." 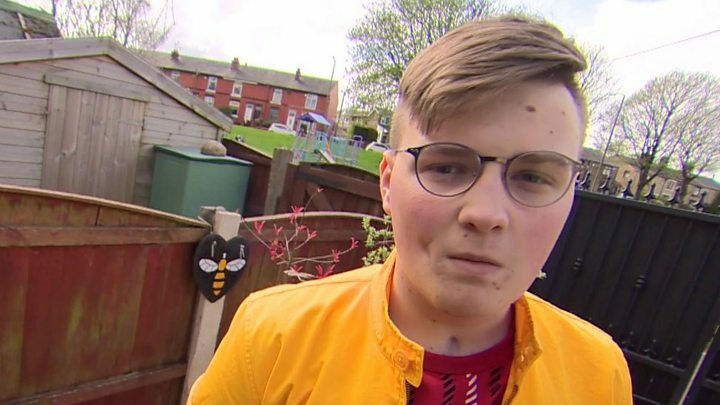 Dan Hett, whose brother Martyn died in the attack, told the BBC the support he had received had been "overwhelming". He said he had been picked up off his feet and hugged by everyone from an "old lady in a supermarket to a six-foot biker". Speaking before the memorial service, he said it illustrated the support which "has come from every possible corner of Manchester". He also tweeted a photograph of him with his brother, which has been trending on social media, along with the hashtag #BeMoreMartyn. Ella McGovern, from Rossendale in Lancashire, suffered shrapnel wounds to her legs in the blast. The 15-year-old has since climbed Ben Nevis and completed a 10k run. Her mother Louise McGovern said the anniversary would be "extremely emotional". "I'm looking forward to being with everyone in Manchester - I think that will be very nice and positive - but I think I'm going to pack a few tissues." Image caption Cath Hill says the Manchester Survivors' Choir want to "make something positive out of this"
Cath Hill, who is in Manchester Survivors' Choir, a group made up of people who were at the arena on the night of the concert, said while they had "been through something really difficult... we do want to stand up and rise up and show everybody that we are carrying on". Daren Buckley's life changed forever when the home-made device detonated metres away where he and his son were standing. Yet the father of four's first instinct was not to flee, but to run to help the wounded. He said: "The scenes in the foyer I can't describe. It was like a nightmare." A year later he remains traumatised, saying: "I have flashbacks. I must've died 200 times in my nightmares." Greater Manchester Mayor Andy Burnham tweeted his support for everyone affected by the explosion. "Today we come together, we remember each of the 22 people whose lives were taken," he wrote. Dan Smith, the second paramedic to arrive at the scene of the attack, said it would be a "difficult day [as] this date will never be the same again". He said he did not want to dwell on the "devastation", but focus on the "positives" from the night, the lives that were saved and the amazing response from Manchester and beyond. 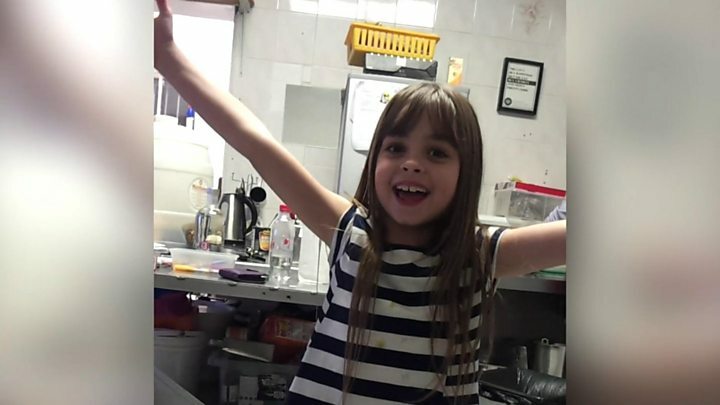 Media captionEight-year-old Saffie Roussos was one of 22 people killed in the Manchester arena attack. In a statement on Facebook issued ahead of her attending the service, Mrs May said the attack had been "designed to strike at the heart of our values and our way of life, in one of our most vibrant cities, with the aim of breaking our resolve and dividing us. It failed". "As we gather in Manchester Cathedral... we will join in solidarity to remember the 22 children and adults who so tragically lost their lives that night. "We will pause to think of their friends and family, of the many who were injured and to pay tribute to those who have come to their aid, offered support, expertise and kindness." Shadow home secretary Dianne Abbot and Green Party co-leader Caroline Lucas also tweeted tributes. Manchester United stars Ashley Young and Jesse Lingard were among the city's sports stars sharing their thoughts. Celebrities have also paid tribute to the victims of the attack on social media. Manchester-born actress and Strictly Come Dancing star Gemma Atkinson posted a picture on Instagram of the Manchester bee symbol, which became an image of defiance and solidarity in the aftermath of the attack, while stars of the Manchester-based soap Coronation Street, including Lucy Fallon and Daniel Brocklebank, also paid tribute. You can view special coverage of the "Manchester Together" commemoration event between 19:00 and 21:00 BST on the BBC news channel or via the BBC News website.